DJ Triplet Entertainment carries £10million Public Liability Cover and is a member of the Mobile DJ Network. 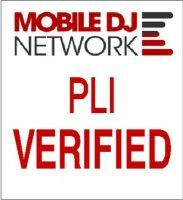 Click the Mobile DJ Network logo to view our PLI certification. DJ Triplet Entertainment offers mobile disco / DJ services to the Surrey, Croydon, Sutton, Bromley and surrounding areas. Many traditional DJs seem to play their tracks in a somewhat random order and worse still may like their voice to be heard more than the music so will talk and crack jokes on the mic over the music all night long. This is not DJ Triplet Entertainment. Our goal is to provide great music that our clients want to hear with a contemporary approach – this means seamless beatmixing and utilising the microphone only when it is actually necessary alongside an exciting light show on the dancefloor. We take great care in programming great sets of music for your party or wedding disco incorporating multiple genres which should mix smoothly from one song to another. Now for a 18-21st Birthday party, it might be just fine to play all the current dance or club music all night however this set probably won’t work well at a wedding as many of your guests will be left disappointed. We look to read the crowd and change the musical genre and mood as appropriate with the aim that everyone hears music which they enjoy and none of your guests feel alienated from the dancefloor. We love to accept requests and believe every mobile DJ should do the same, we encourage must-play, play if possible and do-not-play lists but remind our clients that they should bear in mind that a DJ will normally only get through around 80-100 tracks in a 5 hour party or wedding reception! We therefore cannot always guarantee every request we receive will be played as we have to piece together a set that will have the right flow and vibe with the aim of increasing the energy on the dancefloor throughout the night. We do always look to play those must play tracks and even play all those "play if possible" tunes too. We possess a professional sound and lighting set up which is highly reliable to provide you with the ultimate party experience and just in case something unforeseen does occur we carry back up gear so that the party can keep going with little or no interruption. We also hold an extensive music library so can accommodate a variety of tastes from all decades to keep your party entertained. Our music is legally sourced from DJ only music providers which means that we usually get our hands on many of the latest tracks before they are even released. At DJ Triplet Entertainment Mobile Disco we also offer video projection onto our exquisite Liteconsole DJ booth. This presents an opportunity to display music videos, exciting visuals, personalised messages or even your own photos - Imagine your wedding first dance with images of you both being displayed in a slideshow in the background. Upon booking you can expect a digitally signed contract to give you peace of mind that we are committed to and can be relied upon for your special event. DJ Triplet is also a full member of the Alliance of Mobile and Party DJs which means that we have support of the largest national DJ organisation in the UK. The terms of membership with AMPdj ensures that members conduct themselves in a professional manner with their clients. DJ Triplet also holds Public Liability Insurance up to £10million - PLI is often a requirement to perform in venues and this means that you can rest assured that your DJ will be able to perform and will be covered for any unforeseen damage to the venue or injury to any guests caused by the DJ equipment however unlikely.